This week it was announced that a tasty heavyweight clash between Polish warrior Tomasz Adamek and American “Fast” Eddie Chambers is scheduled for June 16 at Adamek’s home base, the Prudential Center in Newark, New Jersey. The fight will also be broadcast nationally as part of the NBC Sports Network’s Fight Night boxing series. This one is really interesting, because both fighters have not exactly been on hot streaks lately. And both fighters have something in common: they have both been badly beaten by one of the world heavyweight champion Klitschko brothers. Adamek (45-2, 28 KOs) was humiliated by WBC champion Vitali Klitschko last year, suffering a TKO loss in front of a stadium full of fans in Wroclaw, Poland: after the fight, Klitschko remarked that while former cruiserweight king Adamek is a great fighter, he doesn’t belong in the heavyweight division. Adamek didn’t exactly dispel that notion in his recent “comeback” fight, either, going the distance with the underwhelming Nagy Aguilera. Chambers (36-2, 18 KOs) has had his own issues as of late. After being knocked out by Wladimir Klitschko in a horrifying fashion in Germany in early 2010, Chambers has fought exactly once, a unanimous decision win over Derric Rossy in early 2011. Since then, Chambers has been having trouble even getting in the ring: he angered fellow American heavyweight Tony Thompson by pulling out late on their scheduled tilt with an injury, and then enraged Sergei Liakhovich when he did the same thing before their bout. As a result, there are rumors out there that after his scary KO at the hands of Wlad, “Fast Eddie” has become gun-shy. If Chambers somehow doesn’t show up for Adamek, his boxing career will be hanging by a thread. To call this one a “must-win” for both fighters in thus an understatement. Enigmatic UK heavyweight contender Dereck “Del Boy” Chisora (15-3, 9 KOs) isn’t letting his recent suspension by the British Boxing Board of Control get him down. Chisora–who recently angered the Klitschko brothers by slapping Vitali and spitting water in Wlad’s face, all before brawling with fellow UK heavyweight David Haye at a press conference following his loss to the elder Klitschko—showed up in Moscow this week to entertain the fans with some chit-chat and even a spot of dancing before Russian cruiserweight Denis Lebedev’s easy KO win over Shawn Cox. Chisora expressed surprise and gratitude over the size of his Russian fan base, and promised the crowd “big things at the end of the year” for him in Moscow. Indeed, Del Boy recently said that, should his appeal with the BBBoC not work out, he may apply for a license to box in Russia. Considering the fact that Haye, who is as of now “retired,” will have his own issues getting a license to fight again following the brawl in Germany, perhaps the best way for the two to get in the ring and settle their differences is to meet on neutral turf in Mother Russia, where the BBBoC’s rulings mean absolutely nothing. I mean, if the Russians can fly over superstar boxing announcer Michael Buffer for a low-profile Denis Lebedev fight, they can probably come up with enough rubles to make it worthwhile for Haye and Chisora to mix it up in Moscow in a grudge fight for the ages. The mysterious careers of undefeated Russian heavyweights Denis Boytsov and Alexander Ustinov are set to continue on their often inexplicable paths. While both Boytsov (30-0, 25 KOs) and Ustinov (26-0, 20 KOs) are often touted as two of the heavyweights out there with a lot of potential, neither man has been getting in the ring with anyone lately who can provide even a modicum of competition. However, both are taking some baby steps forward in their upcoming fights. 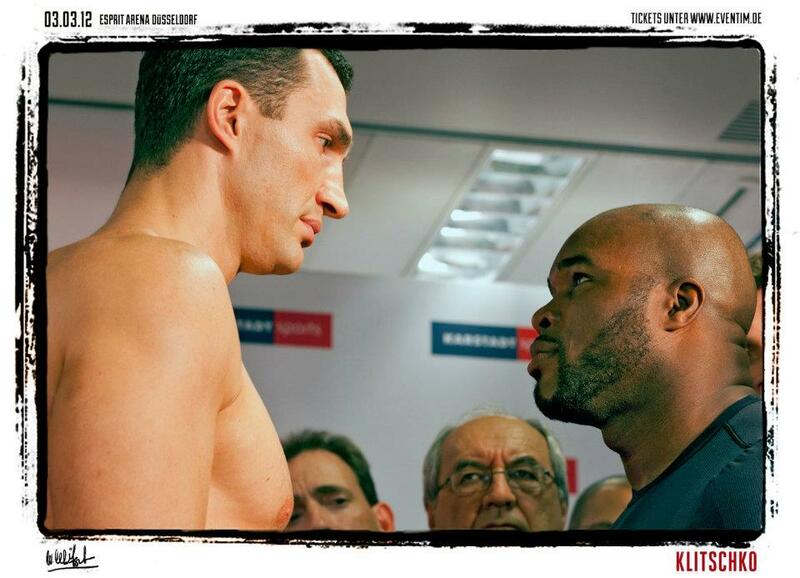 Scrappy American heavyweight Jason Gavern (21-9-4, 10 KOs) tells Power Shots that he is going to be doing battle with the 6’7 ½” Russian giant Ustinov, a Klitschko protégé, on April 26 in Ukraine. Gavern, 34, is the type of game journeyman veteran who can surprise, such as he did when he drew with another ascendent Klitschko associate, American Johnathan Banks, in 2010. In his last fight, taken on two days’ notice, Gavern put up some good resistance against rising Polish heavyweight Mariusz Wach before getting stopped in the sixth round. Boytsov, meanwhile, gets in with the man with possibly the worst nickname in boxing, Dominick “The Southern Disaster” Guinn (33-8-1, 22 KOs) in Germany on Friday, April 13, in Germany (The Southern Disaster fighting on Friday the Thirteenth?). Guinn was once seen as a rising heavyweight prospect, but his career has been in the doldrums, and he’s coming into this fight off of UD losses to Bulgarian bad boy Kubrat Pulev and the recently re-incarcerated American Amir Mansour. Nevertheless, Guinn has likely still got enough left to provide the muscular Boytsov with something more than just token resistance. Fans of the heavyweight division can attend “A Heavyweight Bash” on Friday, June 8th as part of the 23rd Annual Hall of Fame Induction Weekend, June 7-10th in Canastota, NY. Big names from the heavyweight division’s past will include former heavyweight champions Michael Moorer, Ken Norton, Ray Mercer and Leon Spinks; and former heavyweight contenders George Chuvalo, Chuck Wepner and Gerry Cooney. The event will begin at 7:30 p.m. at the Rusty Rail Party House in Canastota, NY and consist of fight highlights, speeches, photograph and autograph opportunities and hors d’oeuvres. Tickets are priced at $60 each. Listening to world heavyweight boxing champion Wladimir Klitschko on a conference call this week from Germany, it became clear that the normally genial and laid-back Ukrainian was a little more tense than usual as Saturday’s fight with Jean Marc Mormeck of France approaches. 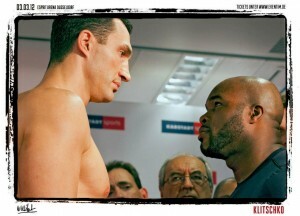 Klitschko faces Mormeck at the weigh-in. Klitschko and his trainer Emanuel Steward have been reading the boxing press, and bristling at the suggestion, made by many (including this writer), that the cerebral and methodical champ needs to step up his game and get rid of the seemingly over-matched Mormeck both quickly and in spectacular fashion in order to satisfy his numerous (on this side of the pond, anyway) critics. Steward was first up, trying to tamp down expectations of a blowout in front of an estimated 50,000 European boxing fans on Saturday in Düsseldorf, Germany. “It’s not the type of a fight that he can come out like everyone thinks and just blow the guy away,” said Steward. “It’s so frustrating with these comments that we’re reading. And I understand the fans’ opinion, but I just think style-wise, it’s not going to be the type of a fight where you can just knock the guy out early, because his head is going to be bobbing and weaving. So when you fight a guy like that you have to fight a very patient fight. “You have to jab and learn to control the guy’s head, because his head is upfront, which means you control his head, you control his whole weight, and which means you have to fight a patient, systematic fight to break the guy down, much like Lennox [Lewis] had to do with Mike Tyson. “But according to all of the experts, if the fight goes over three rounds or four rounds, it’s considered a terrible performance. If Wladimir knocks him out in a minute, it’s what he was supposed to do, so we’re going into a definitely no-win situation,” Steward lamented. The champion then spoke, and both his tone and the cutting nature of some of his comments made it clear that he is tired of the idea that there is something wrong with the way he fights, and offended by the notion that he needs to do something differently this time. “I think you’re more frustrated that anyone else,” Klitschko snarked at one reporter who suggested that the Klitschko brothers might find the current heavyweight division’s competition less than satisfactory. Wladimir also emphasized the fact that while size is important, it isn’t the determining factor in most title fights. “It’s a tough job to fight a shorter guy,” said Wladimir. “And trust me, it costs you more energy as a bigger guy. It’s on one side an advantage because of the size and weight, but it’s not always an advantage. In other words, the champion has no intention of changing his approach for Jean Marc Mormeck or anybody else. As always for Wladimir, it’s going to be chess match. If it ain’t broke, he reasons, don’t fix it. “If our fights were kind of sloppy and we were getting punched in the face and we needed to have a shoehorn to put the hat on after the fights, probably that would be exciting for the fans,” Klitschko said sarcastically of he and his brother Vitali’s heavyweight dominance. “I know what to expect from my opponents. I know the game, and it’s actually a chess game for me, believe it or not. So when you’re well prepared, there is nothing that can surprise you. 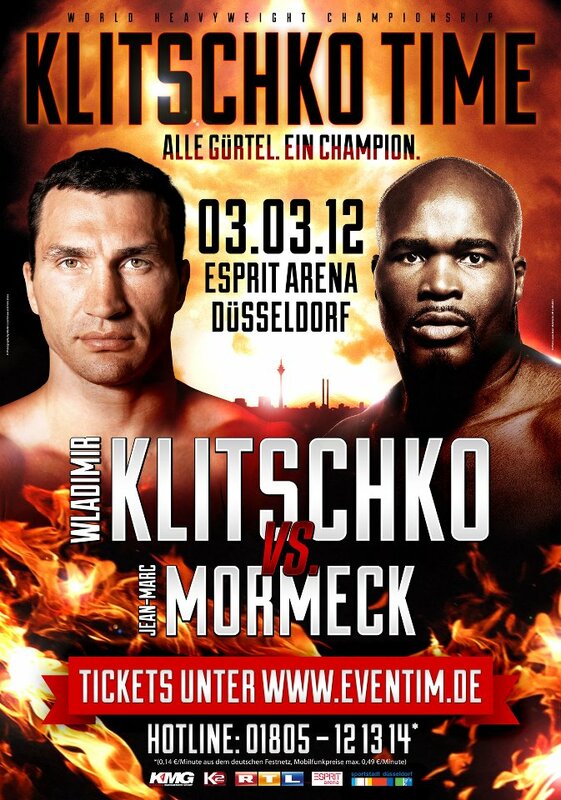 Following two straight weekends of exciting heavyweight fights, world heavyweight champion Wladimir Klitschko and French challenger Jean Marc Mormeck will try to make it a triple play when they meet this coming Saturday in Dusseldorf, Germany. Just after the HBO network had announced that it was giving up on the heavyweights, Vitali Klitschko and Dereck Chisora (with an assist from David Haye), along with Alexander Povetkin and Marco “Captain” Huck, showed why contests featuring the big fellas can be exciting in a way that the lower weight divisions just can’t match. Thankfully, new cable player EPIX picked up these fights and allowed interested American fans a chance to see some dramatic heavyweight action. There is, however, widespread cynicism about the Wlad-Mormeck matchup (also on EPIX). The French challenger is short (under six feet tall), not exactly young at age 39, and has not had a distinguished run at heavyweight since moving up from the cruiserweight division in 2009. There is a feeling out there in the boxing public that this is a throwaway title defense for the younger, stronger, larger Klitschko, though it could also be argued that Wladimir has earned an easy one after facing the best in the division for the last few years. 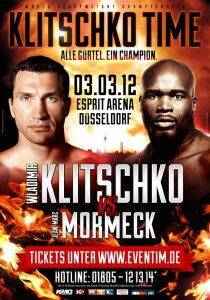 Resultantly, there is almost no pressure on Mormeck (36-4-0, 22 KOs) going into this fight. Everyone outside of Mormeck’s own immediate family expects him to lose, and perhaps even they are hedging their bets. If Mormeck somehow avoids ending his night lying on the canvas and staring up at the referee, he’ll have exceeded most people’s expectations. For Klitschko (56-3, 49 KOs), however, there is immense pressure this time not only to win, but to look very good while doing it. A chess match in the ring is not what is called for this time out, with even Klitschko trainer Emanuel Steward complaining about the lack of knockouts in heavyweight boxing as of late. At today’s final press conference in Germany, Klitschko seemed to acknowledge the pressure that is on him to produce fireworks against Mormeck, and he at least tried to take some of the heat off and reduce the boxing public’s expectations of an easy win. “I still have the hunger and I do not take this fight lightly,” Wladimir said. “It is extremely difficult to box against a man who is a lot shorter. It does not make my job easier. All of that is fine and dandy, but none it changes the fact that anything less than a spectacular knockout win for Klitschko this Saturday night will see him answering numerous questions as to what went wrong. A unanimous decision is not going to be enough against Mormeck. It’s time to for the cerebral Wladimir to put the chess set away, and go for broke.